It's official, after weeks of speculation Congressman Bob Filner has entered the race to become San Diego's next mayor. 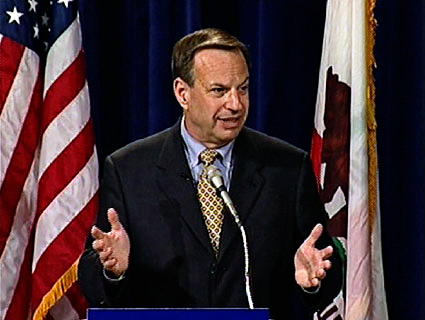 Filner is the first high-profile Democratic candidate to announce his candidacy. He joins Republican candidates Bonnie Dumanis, Nathan Fletcher, and councilmember Carl DeMaio. Last week Democratic State Senator Christine Kehoe formed an exploratory committee. Hours before Filner announced his candidacy, the local Republican party launched their own campaign aimed at discrediting Filner and his run for mayor. Visduh June 8, 2011 @ 7:46 p.m.
Look at the field of candidates. Only DeMaio is not in the pocket of the establishment. Does he stand a chance? I do not know, but Filner may be a viable alternative. He's at an age when this would be his last hurrah. So he might actually do something to put the city on the track to recovery. His statement today, as I heard it, was taking on the past decisions that promised too much to too many. The promises that really cost are those made to municipal employees who now expect to earn six-figure salaries for cleaning rest rooms and such. Will Bob walk the talk? That's hard to say, but the last four mayors haven't done anything that needed to be done. So, fellow conservatives, take a look at ol' Bob before you dismiss him. He could surprise. SurfPuppy619 June 8, 2011 @ 8:32 p.m. If Carl DeMaio runs I am voting for him, if not then it is Filner. I Am Stardirt June 9, 2011 @ 12:07 a.m.
Let's hope we don't have to see any mayoral candidate genitalia pics on the Internet. I don't think I could handle it. Duhbya June 9, 2011 @ 4:13 a.m. But can we assume that uteri shots would earn your approval? I Am Stardirt June 9, 2011 @ 8:23 p.m.
LOL I can see why you would think that. SurfPuppy619 June 9, 2011 @ 8:50 p.m.
============ As long as it is not Bonnnie's. MURPHYJUNK June 9, 2011 @ 7:30 a.m.
"Let's hope we don't have to see any mayoral candidate genitalia pics on the Internet. I don't think I could handle it." Visduh June 9, 2011 @ 9:22 a.m.
What's worse, Filner's expression or, as one commenter recently said was Bahnee's "ugly mug and hideous Boston accent?" Four or more years of her pontifications in her downeast diction would leave me permanently nauseated. And I don't even live in SD! I Am Stardirt June 9, 2011 @ 8:25 p.m.
That's what drove my brain in an aweful direction. That and his attempt at holding onto his civil rights legacy. What has he done lately? Anyone want to enlighten me? Twister June 9, 2011 @ 9:01 p.m. Better take a hard look at de Maio's background. He can talk the talk, but will he walk the walk or be a "promise them anything, but give it to them in the . . ."? I've had enough of that Giant Sucking Sound, but if he can lick the lady yankee, I reckon I'll settle for him. But we need to take a hard look at Filner too. Is he flip or a flop? hihateboer June 10, 2011 @ 3:03 p.m.
For my money, I think Dumanis is the one who can and will do the most for San Diego. I Am Stardirt June 14, 2011 @ 10:01 a.m.
monaghan June 12, 2011 @ 7:49 p.m.
People who don't live in San Diego probably shouldn't be cluttering up these spaces with their opinions on the San Diego mayoral race. For the rest of us, why on earth would anyone want someone like Carl DiMaio or Bonnie Dumanis for Mayor when there is a practical, resilient, fair-minded, people-oriented, experienced politician like Bob Filner who actually wants to contend for the job and would know what to do once he got it? Dumanis is a former judge, folks, and DeMaio has been called wrong on so many of his facts-of-civic life that we can't trust his pronouncements. Filner is beholden to no one and, like Governor Jerry Brown, is willing now to take on tough issues for the greater good. At this point in his life, Filner would work to restore municipal finances from the red to the black, could find reasonable common ground with municipal employees, would establish a viable plan for the physical future of the City beyond ball parks, football stadiums and convention center expansions, and could rekindle cooperation between the City and the School District on joint-use of playgrounds, parks and libraries. Although the Mayor's race is non-partisan, as a Democrat Filner would have pretty-good support from the largely Democratic City Council. I think Bob Filner could be a game-changer for San Diego. SurfPuppy619 June 12, 2011 @ 8:16 p.m.
DeMaio is the ONLY person in San Diego gov who is addressing pay and pension issues. Liek I said, I really liek Filner, and I also really like DeMaio which makes me sort of an odd duck, but I think either one would be LIGHT YEARS ahead of KFC Sanders-who IMO has turned out just like Arnold, a flop. Visduh June 14, 2011 @ 8:31 a.m.
Why is it that "People who don't live in San Diego probably shouldn't be cluttering up these spaces with their opinions on the San Diego mayoral race?" We all have an opinion, and it is not as though the Reader blogs are usually buried in comment. Sadly, what happens in SD spills over into the rest of this county, and affects nearly twenty smaller cities. (Some of those cities are better run than SD, some are just about as mismanaged, and a few are even worse. Yes, I said worse!) But SD sets the pace for all sorts of values, priorities, and comparisons. And that's why.